The Finnish capital region is quickly evolving into a deliciously different destination for craft brew hunters. Here are six hip microbreweries around town. Worth a visit if only for the cult location, Stadin Panimo is an experimental microbrewery tucked away in a nook of the old Suvilahti gas plant. On a Friday night, the bar is packed with tapas munchers who gladly pay extra for a truly aromatic amber tipple. The first sip of Rye India Vienna Lager instantly confirms why: the intensely fruity flavour puts supermarket beers to shame. “We use the finest American hops and infuse extra oomph by filtering the beer through a sieve full of fresh hops, like making fresh tea,” explains Sales Manager Ingrid Viertola. The entire process is executed by hand, including the mashing. “Even the smallest breweries normally use mechanical mixers, but we do it with a paddle – like medieval monks,” says Viertola. To date, the brewery has created over 600 beers, including unusual innovations such as Birch-Mead Lager and Grapefruit IPA. The latest entrant on Helsinki’s craft beer scene is Ohrana, a designerly pub with a downstairs microbrewery. Every detail from the sleek beer glasses to the black-walled décor is a study in understated elegance. A pun on the Finnish word for barley, ohra, the brewery takes its name from the Russian’s Tsar’s secret police, which were formerly headquartered in a nearby building. With its immaculate styling, the bar attracts a mixed clientele of aficionados and craft beer virgins – many of whom soon become regulars. “I like to mix a little bit of new and old and make drinkable beers with a little twist – but not trying too hard,” says head brewer Jani Suomalainen. Ohrana’s top sellers are Kölssi, a kölsch-style brew; Belgian-inspired Saison; and Ohrana APA. Suomalainen’s latest experiment is a boldly flavoured imperial stout, Mustalista (black list), which has garnered glowing praises from beer critics. “This is my first job in which I not only can but must drink beer during the workday. That’s why we only brew beers we like to drink,” says CEO Heikki Ylinen, head brewer and “master drinker” at the Fat Lizard Brewing Company in the Espoo district of Otaniemi. Prior to starting the business, Ylinen visited breweries around the world and learned the ropes in the US, the home of craft beer. “Eventually, we built our own brewing equipment to ensure that we can create perfect beers – every time.” And that’s no empty promise. Fat Lizard beers are brewed without compromise, with an absolute guarantee of freshness. “Generously hopped IPAs are best served fresh, like freshly baked bread. We deliver the beer ourselves straight from the brewery, and Fat Lizard Fresh Taps come with a guarantee that the beer is always under 30 days old, with all the aromas intact. We’re the first in the world to offer this,” notes Ylinen. 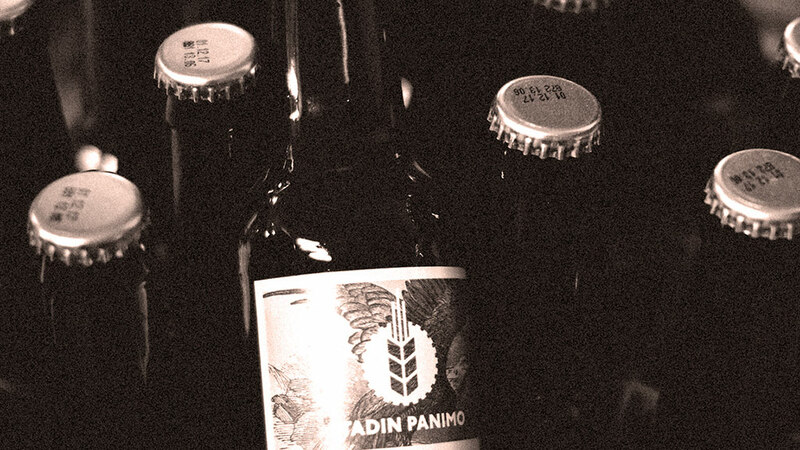 A raved-about innovator on the craft beer scene is Vallilan Panimo, which brews its exclusive range in a former pharmaceutical plant in the industrial precinct of Vallila. Founded by Miika Haverinen – who turned his home-brewing hobby into a business two years ago – the six-man microbrewery produces small batches and sells most of its products within a radius of a couple of miles. “We really are craft-based, from bottling and labelling by hand to sales and marketing. We combine flavour and aesthetics,” explains Markus Koistinen, designer of the brand’s clean graphic identity and packaging. Focusing on its core IPA range, the brewery’s top products include critic-lauded Vallila Amber Ale and Kyyneleet (Finnish for “tears”), an English Pale Ale made for the Finnish rapper Eevil Stöö. The brewery has also created the official low-alcohol beer of Kulttuurisauna, a design-minded public sauna in Merihaka.